Dave Blair is passionate about building boats that work well. Dave has been building boats for over 35 years. Apprenticed on Auckland’s North Shore in the 1970’s he grew up building solid cruising boats and innovative racing boats. On completion of his apprenticeship he spent five years in California extending his skill base including doing the tooling for an ultra light production boat. The ‘Express 37’ is still competing on San Francisco Bay. Blair Boats was established in Warkworth 1989. Dave has enjoyed diverse and challenging projects. From the building of a Falmouth Quay Punt Replic, ‘Lark’ from a set of rough drawings taken from the 100 year old ‘Curlew‘. To building an ultra light 8.5 meter racing trimaran ‘Lucifer‘. In-between the 66’ Warren Muir modern classic ‘Van Diemen 111‘, 11 meter Grainger catamaran’ Razzel’, 45’ spray design with a “violin finish” ‘Hei hei and others added professional development and interest. Dave’s passion for sailing extends from being an avid local club racer (winner KKCC Winter series 2009). He raced in California on ultra light boats such as ‘Merlin’. He has successfully competed in national and international competitions as the Australian Match Racing Nationals (3rd 2004), Hamilton Island Race Week (division winner2008), Coastal Classic (division winner) NZ Keelboat Nationals (winner 2006). Cruising has also enriched Dave’s life, being delivering ’Shanachie’, a 50’ Whiting he built over 20 years ago, to New Zealand from Tonga. Dave was on Robert Vaughans' Van Diemen 111, that Blair Boats built , when she won Hamilton Island Race Week 2008, another fun week to get a third place 2018. 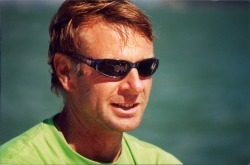 Dave Blair, still building boats, still sailing boats, loaded with experience and joy for things that float. Mike makes things. Most things, creative, practical and innovative Mikes skills in creating and designing complement his solid get it done work ethic. Mike worked at Blair Boats on the Van Diemen 111 project, then at Ashby's Yard. We caught up with him again on Blair Boats move North. Mike has been a core team member at the Blair Boats Limited Yard since the relocation to Kerikeri. Often boatbuilders modify 20 litre resin containers to carry tools. Mike does that too. But Mikes main tool box has so much more class.